Now that it’s April, many cyclists are dusting off their bikes and heading out for their first ride of the season. And off-road bicycle paths are often the first places cyclists look to for those early season warm-up rides. The good news is that there are a lot of exciting bike path improvement projects heading to our region for 2019. Check out our updates below. And if you know of any other bike path improvement projects in the pipeline for this year, email us and we’ll update this posting again with the new information. The North County Trailway is one of three trailway segments that was constructed on the abandoned Putnam Division of the New York Central Railroad. Because the North County Trailway was also one of the first segments to be constructed on this rail line, some portions of the trail are now more than 20 years old and are in disrepair. However, the entire length of this trailway segment, between the Putnam County line and Old Saw Mill River Road in Tarrytown, will be resurfaced and repaired during 2019. If you ride the trail this year, be prepared for trail closures to occur anywhere along the trail. 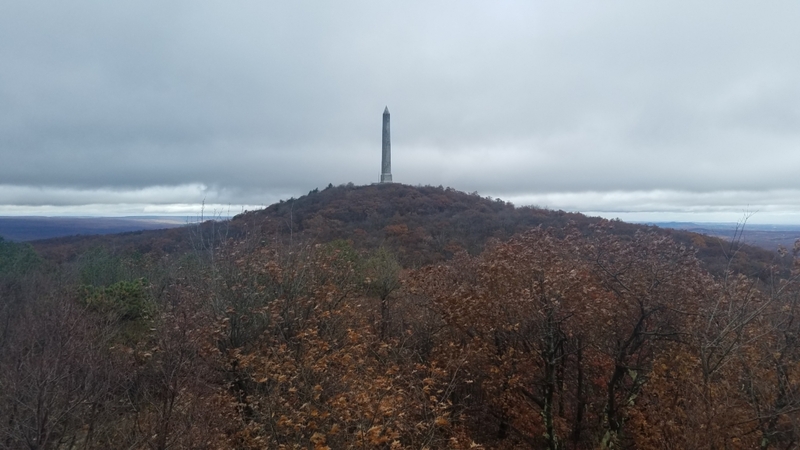 It may be worth checking the Westchester County Department of Parks, Recreation and Conservation Facebook page to see if they have information about trail closures before you head out for your ride. 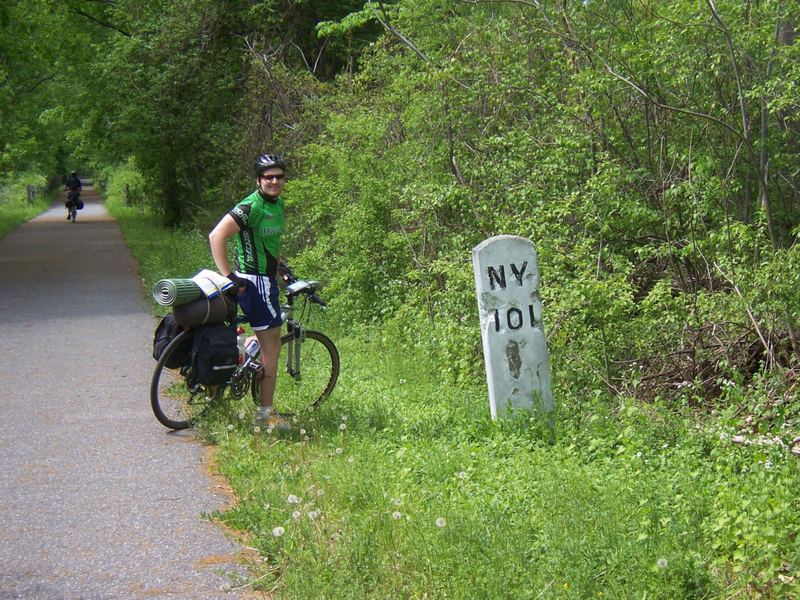 This trail is the prominent feature of our Hudson Valley Craft Brewery Bike Tour. If you do our tour, we can give you advance information of trail closures and we can shuttle you around them if they are impassible. If you’ve ever taken the Metro-North Harlem Line train all the way to the end, you’ll notice that the Harlem Valley Rail Trail begins where the train tracks end. That’s because this rail trail was constructed atop the railroad abandonment, which constitutes all of the rail right-of-way north of the Wassaic station. 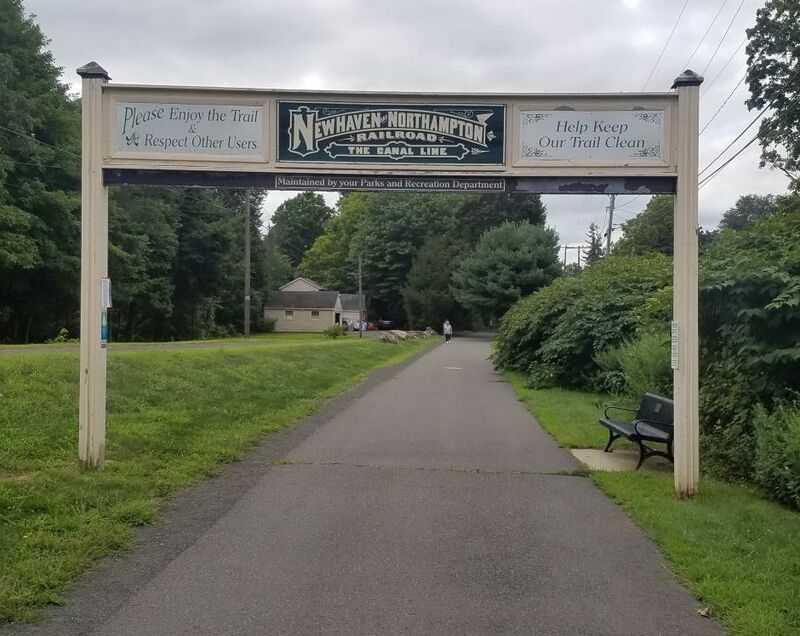 This is one of the region’s most beautiful rail trails and it is a highlight of both our Hudson Valley Bike Tour and the Harlem Valley Rail Ride and Festival. Over the years, it has been a challenge to construct a rail trail on top of the entire former rail line. 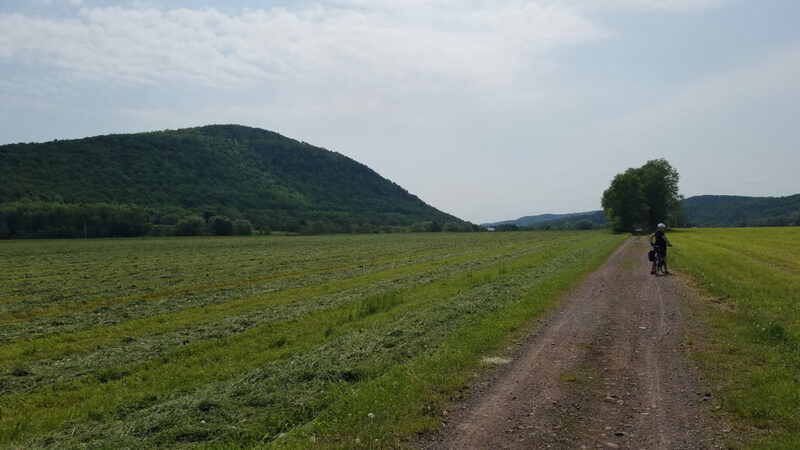 An 8-mile segment has always been missing in between the Village of Millerton and Under Mountain Road in the Town of Ancram, which has necessitated that riders go on hilly (but beautiful) back roads to ride the whole trail. However, construction has begun on this missing piece of trail and it is expected to be complete by October 2020. This will be a major undertaking requiring 4,100 feet of elevated boardwalks and the rehabilitation of six bridges. But when it is completed, it will surely be an amazing bike path. Read the whole story here. 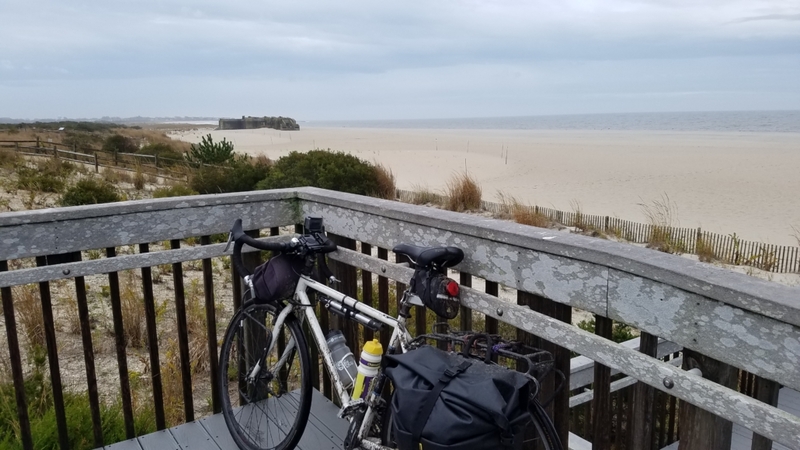 If you are familiar with Jones Beach State Park, you might know about the Ocean Parkway Coastal Greenway, which is a great bike path that follows Ocean Parkway. Later this year construction will begin to extend this bike path for an additional 10 miles between its current terminus at Tobay Beach and Captree State Park. This bike path will greatly increase the amount of shoreline that is accessible by bikes in both Nassau and Suffolk Counties. The bike path is expected to be completed by the summer of 2020. Have you ever done Summer Streets in Manhattan? It’s great. For three Saturdays every August, the City shuts down Park Avenue just for bikes. 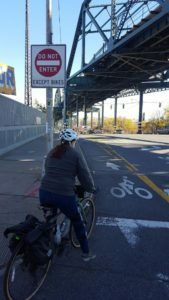 The lack of a bike path or sidewalk on the Verrazanno Narrows Bridge has long been an issue for people looking to bike between the two heavily populated boroughs. The MTA has attempted to address this by providing bicycle racks on the S53 and S93 buses, but there is still a push to allow cyclists to simply ride across the bridge. This may be accomplished this summer if the Verrazzano Bridge Summer Streets intiative moves forward. However, it is important to note that the Port Authority’s “Restoring the George” project will not do much to improve bicycle mobility across this bridge, since the project is more or less only considering “replacement in-kind” of the existing sidewalks. 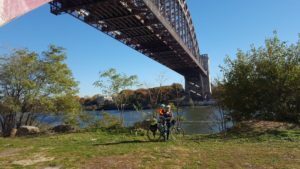 To advocate for better improvements, all non-motorized users of the George Washington Bridge are strongly encouraged to go to https://completegeorge.org/ to learn more about how you can advocate for a better plan. And finally, as this blog reported back in October of 2018, the long-awaited “shared use path” on the new Mario Cuomo Bridge is set to arrive later this year. This will be a major, major improvement for cyclists and pedestrians in the Hudson Valley. Check it out! If you are looking for a great 3- to 5-day bike tour that is scenic and diverse…and will also give you bragging rights for biking across an entire state, look no further than New Jersey. New Jersey is often overlooked as a bicycle tourism destination since so much of New Jersey’s image is negatively stereotyped with a car-focused identity: “Jersey barriers”, the Turnpike, Paramus’s shopping malls, etc. But the fact is, the New Jersey you can see from a bike is far different than the New Jersey you usually see from a car. New Jersey has an extensive bike trail network built on old canals and abandoned train lines that can take you long distances without seeing any cars. From a bike, you get a totally different version of the Garden State: one that has rolling Appalachian foothills, quaint mill towns, quiet streams, the scenic Delaware River, expansive farms, bright red cranberry bogs, fragrant pine forests, wineries, historic sites, and of course, beautiful beaches. 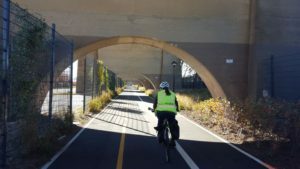 New Jersey also has a robust bike-friendly transit system that can help get you to or from your ride, or give you plenty of options if you need to bail out part way. It’s a great bike tour that’s close by and only takes a few days to ride. You’ll also have a very favorable elevation change if you ride north to south, and the southern half of the ride is close to flat. Read on to find out more about what this ride is like and how to set it up. I did this ride by myself over four days in early November of 2018. It was a late foliage season, so I was hoping to get a run of four good weather days to do this trip and see the colors. I took a chance when I saw a 4-day forecast with temperatures staying around 45-55 degrees. But there was also a threat of rain. The weather turned out fine, with a mix of different conditions, but nothing awful. If you have the time, you can take the Metro-North Port Jervis line to the north end of this ride. I did not, so I did a one-way car rental and drove my bike to Port Jervis, NY. I drove out as early as I could on Saturday morning and I returned the car at an Avis location that was mainly a car repair garage (you better hope it’s open…). It was raining, but the forecast said the rain would end in 2 hours. Off in the distance, I could see the hills and High Point, with its obelisk jutting into the sky. The plan was to ride up there first and “tag the summit” before heading down the other side to the valleys below. While not a punishing grind, it was a steady ascent, and the beginning of a long day. But once I reached the windy top of High Point, the view was amazing. And it’s all downhill from here, right? After descending High Point, I rode through beautiful farm valleys splashed with fall colors. The quaint downtown of Branchville was the starting point for the Sussex Branch Trail: a dirt-paved rail trail that goes through remote state preservation lands that are in the between old railroad towns. It is here where the ride is the quietest, with no traffic noise as you follow along streams and pass by lakes. But that rain that happened earlier? Well that left many, many puddles that I had to ride through. This trail is beautiful, so the difficult conditions did not deter me. However, if it had been a sunny dry day, it would have been far better. Fortunately, a warm bed in an outstanding B&B was waiting for me in beautiful Long Valley. Located next to a horse farm, but close enough to bike into town for dinner, The Neighbor House B&B was an ideal setting. Sunday I woke to cold but sunny conditions. Rafi, the owner of the Neighbor House, got me going with a generous breakfast and lots of encouragement. Next it was off onto the Columbia Trail, another rail trail travelling between Morris and Hunterdon Counties. This trail went through steep wooded valleys bursting with fall color and gently roaring with the sounds of streams swelled by yesterday’s rain. Paved with stone dust and cinder, the Columbia Trail is relatively smooth and a far easier ride than the Sussex Branch Trail yesterday. The trail ends in High Bridge, and from there I must ride on back roads to get to Frenchtown. The roads snake along brooks and streams which ultimately flow into the Delaware River. In Frenchtown, slow moving traffic ensured that I could take an entire lane width for myself as I made my way down to the waterfront, where lunch awaited at the Bridge Café . After that, it was 30 miles down the D&R Canal Trail, paralleling the Delaware River. It was a non-stop tunnel of color, with the river sparkling in between the trees as the sun positioned itself in the west. I would need to ride this section without stopping to ensure I made to my hotel before darkness fell. The quiet serenity of D&R Canal Trail continued, even as I passed through the only large city of my bike tour: Trenton. The path goes to the edge of downtown, where I jump off the trail and ride down State Street. It’s 5 p.m. on a Sunday and I have the entire street to myself. I ride past the capitol and beyond to the next trail segment: a park above a waterfront highway. This park, which celebrates the history of Trenton, leads to a ramp that brings you down to a bike path which runs next to the highway. But soon the path veers away and becomes another dirt path in a quiet forest area. The forest feels remote until you notice that you can still see the highway, and occasionally a light rail train flashes past. The path delivered me straight to the center of Bordentown, with its downtown clustered around a light rail station. It would be my jumping off point for the next day. On Monday I headed east into the farm areas of Burlington County. The traffic was heavier because it was a Monday morning, but I managed to get an early start so I could get some miles in before rain overtook the area from the west. About an hour in, the rain started falling, but was already wearing my rain gear, so I was ready. An hour more in the rain meant I was ready to stop for breakfast at a diner. New Jersey has the best diners, so they make great breakfast stops if you want to get a little riding in first. I glanced at the menu and asked myself if it was worth trying pork roll again. Pork roll is a product of Trenton, so it’s mainly found in New Jersey and the immediate areas surrounding it. I skip it – it’s raining out, do I really want heartburn too? Back on the bike it rains as I ride through Fort Dix and into the Pine Barrens. The roads get very quiet and all the roads have bike lanes. Sometimes there are other paved roads that I can take through state forests. These roads have absolutely no cars. 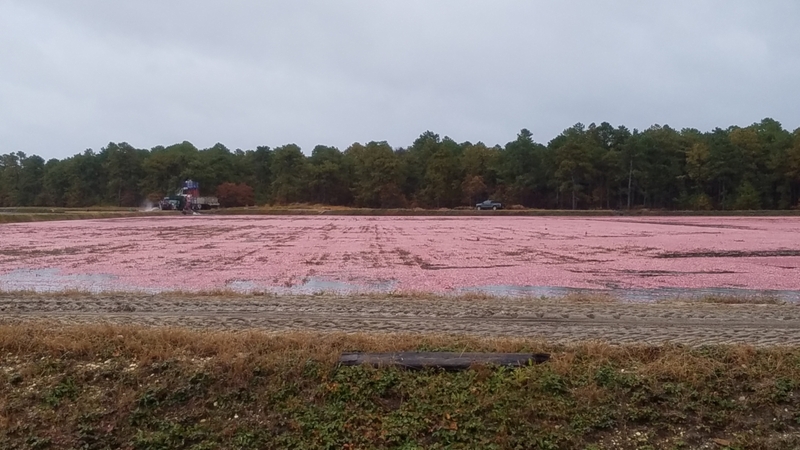 The rain falls more gently now as I pass the vibrantly red cranberry bogs that are being harvested for Thanksgiving. Red cranberries litter the road as I ride to Egg Harbor City where I check in at the Tuscan House of the Renault Winery. This winery is famous since it is the second oldest winery in the United States. To do this, it had to survive Prohibition. And for that, just look a few miles to the east to Atlantic City. Once ruled by mobsters during the Prohibition Era, the winery was part of their racket. Fans of Boardwalk Empire would find this winery interesting! Getting my bike into my huge room was easy. The staff were helpful and the onsite restaurant was a great place to relax before going to bed. The winery did not have any on-site breakfast available the day I was there, so I ate an energy bar and I took off as the sun was rising. This would be my last day of riding, and the plan was to pick up a rental car in Cape May and drive it home. But it’s a long drive and the car rental shop does not have late hours, so an early start was key. Thankfully, there was no rain as I ride south along Route 50, which has a generous shoulder, but also a good deal of traffic. Mays Landing, the County seat of Atlantic County, was a great place to stop for breakfast. It was also Election Day, so the historic buildings were decked out in red-white-and-blue bunting. This time, I’m confident in my ability to finish my final day, so I order the pork roll. But I eat only half of it. Too much sodium and fat! Back in the saddle, it’s grey and foggy. 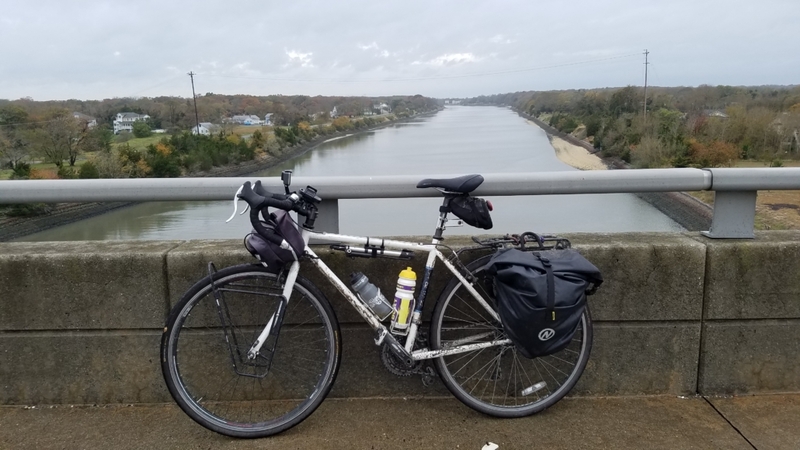 Once I cross the bridge into Cape May County I am able to take advantage of a number of lower-traffic county roads as well as paved bike paths which traverse down the Cape May Peninsula. And even though I got a flat tire after breakfast, I am still on schedule, which allows me time to check out the Hawk Haven winery. The tasting is wonderful. It’s a Tuesday and I have the place to myself and I am able to ask all about their wine. I decide to buy a case to bring home to share with my wife, so they hold the wine for me behind the counter. I’ll come back for it later after I get my car. A few miles later and I am arriving at Cape May point. It’s about 2 p.m. on a Tuesday, and I have the place all to myself. I do the obligatory picture of the lighthouse and then I walk to the beach and enjoy the sight and sound of the ocean as I breathe in the fresh salt air. I need to ride 6 miles back to pick up my rental car, so I decide to take a different route back along the shorefront. I then pick up my rental car, go pick up my wine and head back to NYC. And I even made it in time to vote! I did this trip myself, with no support. I arranged all of the accommodations myself, I spent about 20 hours planning the route and I drove myself to and from the ride using one-way rental cars. I spent about $730 for the entire four days and it was a lot of work to figure this out. Gotham Bicycle Tours can arrange a tour for a small group that is cost-competitive with doing the ride on your own. For about $3300 (plus hotel expenses) we could provide a group of 4 people with a complete tour, with all lodging pre-arranged, a route specifically chosen to fit your group’s interests and GPS navigation. You would also have full van support for the entire ride with rest stops arranged for you. You would always have access to a well-stocked cooler in the van. We can also help get you and your bikes to the start and end points of the ride, saving you lots of time. (This is key since we can drive you to the TOP of High Point to being your ride!) And you wouldn’t need to spend an enormous amount of time planning out your route! Contact me at Lukas@gothambiketours.com or call 917-748-1119 for ideas about planning your end-to-end tour of New Jersey. The Tappan Zee Bridge never made a lot of sense. Why does it cross the Hudson River at its widest point? And why was a bridge like this ever built without a sidewalk or bike path? For over 50 years this bridge has existed to only serve motor vehicles. But the new bridge that has just replaced it will fix that. Yes, the new Tappan Zee Bridge (now called the Governor Mario M. Cuomo Bridge) will finally have a lane just for bicycles and pedestrians! Finally, communities in both Westchester and Rockland Counties will have a way to bike from one side of the river to the other. This is hugely important for increasing non-motorized mobility. What’s more, it also increases the potential for bicycle tourism. And Gotham Bicycle Tours will be offering a new tour in 2019 that goes over the new bridge. As always, it will be transit accessible from NYC…and a beautiful ride. In the meantime check out the new animation which was recently released by state government that shows what the new bike path will look like. There will even be scenic overlooks built into the pathway, with catchy names like “Fish and Ships”. Westchester County lawmakers will spend $8.7 million to improve the North County Trailway, a 20-mile trail from Putnam County down to Eastview. It’ll be the first major construction project on the popular trail since it was built in sections in the 1980s. The county Board of Legislators voted on Oct. 1 to unanimously approve borrowing for the project, which is estimated to last 14 months once it begins. Safety enhancements will include work to a 500-foot bridge over the Croton Reservoir in Yorktown, which lawmakers said has been used occasionally by thrill seekers to jump into the reservoir. Work will include curved fencing and spikes to discourage people from climbing around the fence. New York State owns the trailway and Westchester has leased it since 1994, but the county legislature has asked the administration of County Executive George Latimer to try to strike up a deal to take ownership of the property. But lawmakers approved another 25-year extension lease at a $1 cost to Westchester while negotiations are sparked. Although the state owns the property, the county is responsible for any injury, property damage or death claims. The county approved a $3.2 million settlement with the family of a bicyclist who died after crashing on a stretch of the trailway in Yorktown. The property runs through the towns of Mount Pleasant, New Castle, Yorktown and Somers. It connects to the South County Trailway, which runs to Westchester’s border with the Bronx. Lawmakers OKed this month another $300,000 for a study and design preparation to an area of the South County Trailway, particularly a stretch near Yonkers’ border with Hastings-on-Hudson. Cycling is one of the healthiest ways to get from A to B, but unfortunately it’s sometimes impossible to avoid motorists during your daily commute. One of the best ways to avoid any incidents with motorists is to stay visible at all hours of day. Here are some top ways you can increase your visibility and ensure everyone on the road sees you. This article was created by www.personalinjury-law.com, an organization dedicated to providing the public with information about personal injury and safety information. Nothing in this article should be construed as legal advice, and it is intended for informational use only. Be sure to review your local cycling ordinances to ensure you ride safe and legally. The Harlem Valley Rail Ride Weekend is in the News! The following is a re-posting of an article from the Millerton News, a local newspaper in the Village of Millerton. The article was published on July 25, 2018 and was written by Kaitlin Lyle. MILLERTON— Once again, the Harlem Valley Rail Ride has brought together cyclists from across the state to experience the region’s beauty on Sunday, July 22. Organized at Eddie Collins Field, cyclists could pitch a tent on Friday, July 20 until Monday, July 23. There was a free bonus warm-up ride with a choice of a 12-mile route up the Harlem Valley Rail Trail or a 25- to 35-mile route. Whether emerging from their tents or riding their bikes, cyclists from all walks of life and levels attended the ride. Cyclists could enjoy a 100-mile route, a 72- to 80-mile route, a 45- to 57-mile route or a 23- to 33-mile route. On top of their preparations for their ride around the Harlem Valley, cyclists enjoyed breakfast underneath the park pavilion. Despite the gray clouds overhead and hint of rain on the way, they were determined to put the pedal to the metal as they had chosen. Whether they were riding solo, with their loved ones or making friends on the ride, there was a discernible camaraderie at summer’s most beautiful ride. On top of enticing cyclists from all around the state, the event motivated a couple organizations from the surrounding area to lend a hand. Underneath the pavilion, members of the American Legion Post 178 in Millerton cooked up a storm, serving breakfast and lunch. The Dover High School basketball team volunteered by parking cars and doing other similar tasks; a donation was made to the team. Gotham Bike Tours helped set up the tents for campers overnight in addition to picking visiting cyclists up and bringing them back to the train station. All the way from the Westchester Beemers Motorcycle Club, volunteer “motos” offered free motor service to cyclists in need. With the storm slowly rolling in, volunteers checked on cyclists who were still on the road. While the weather had its sunshine and dark clouds, cyclists made their way back to Eddie Collins Field. https://gothambiketours.com/wp-content/uploads/gotham-bicycle-tours-logo2.png 0 0 Laura Willis https://gothambiketours.com/wp-content/uploads/gotham-bicycle-tours-logo2.png Laura Willis2018-09-14 15:28:002018-09-14 15:28:00The Harlem Valley Rail Ride Weekend is in the News! 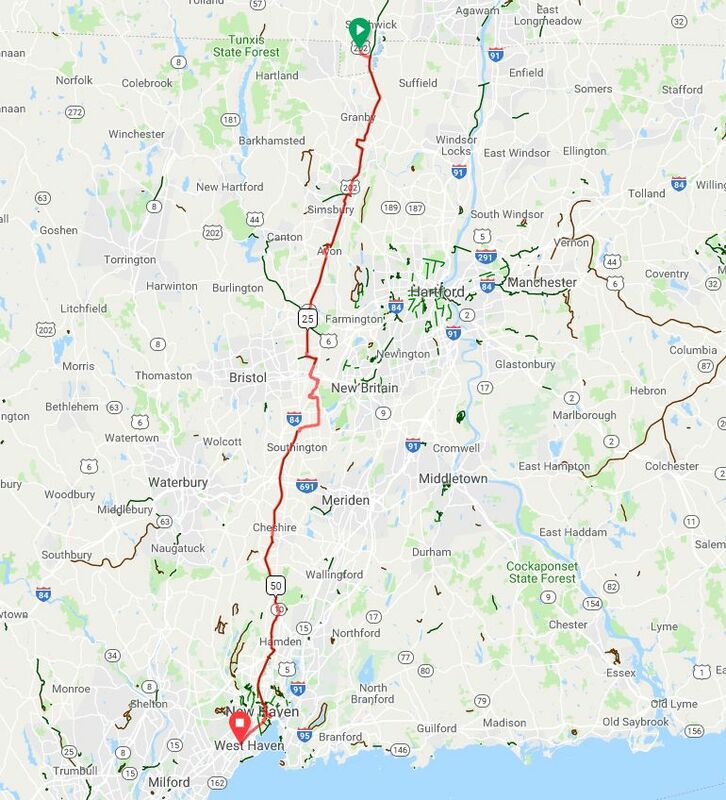 Most people have no idea, but Connecticut is one of the few states that you can cross end-to-end on a car-free bike path. But it gets even better: you can also go an extensive distance in Massachusetts as well, on the same bike path for an even bigger ride. 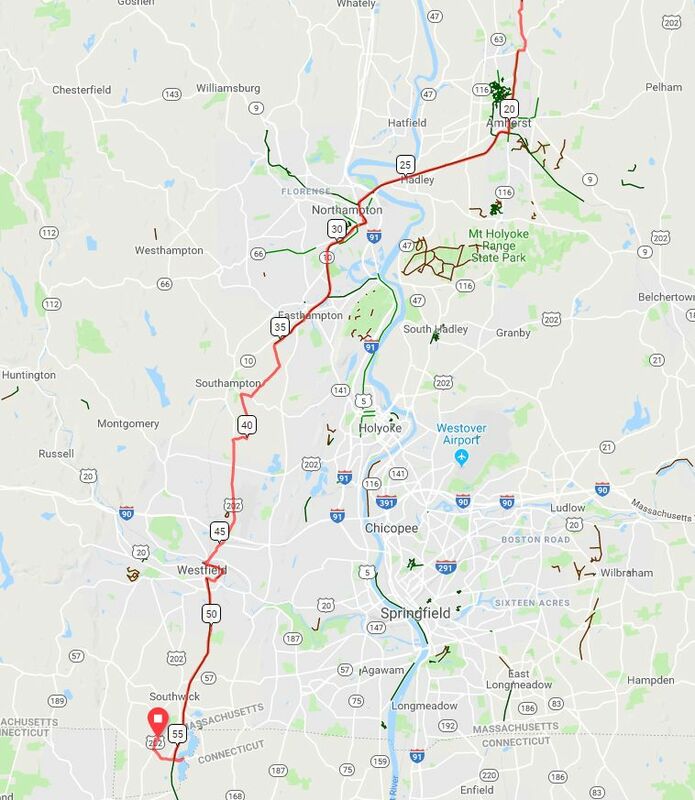 It still gets better: the bike path connects to well-marked on-road bike route networks in Massachusetts once the trail ends. It STILL gets better….you can leverage a new commuter rail system to do your epic ride one way. So what’s the deal? Why don’t you know about this trail yet? Well, I am going to tell you. This trail is awesome! It is so well put together, you’ll think you are in Germany, riding down a scenic radweg, designed by engineers and landscape architects who really care about bikes. Except the Dunkin’ Donuts you just passed will remind you that those dedicated professionals who put this trail together are from Connecticut…and wow – what a great trail. The main issue with the elusiveness of this trail probably has something to do with the fact that it changes names as it goes through different areas. And, of course, you have to go to different websites to get the maps for the differently named trail sections. So that makes it trickier to put your ride together. But make no mistake: you can ride from Amherst, MA to New Haven, CT with only a small amount of on-road riding. And those on-road sections are shrinking as gaps in the trail continue to get bridged with new trail segments. And where the gaps exist, there’s good signage to keep you moving. And sometimes there’s trail alongside the road where you can ride without dealing with cars. Amazing! Although this trail is called a “canal heritage trail” since it follows the route of a canal that once went from New Haven to Northampton, the canal was mostly obliterated by the railroads that came in later. So the trail is basically a rail-trail, laid down where the tracks used to go. It is all paved, and you go through town after town after town….so plenty of services, places to eat, places to stay, etc. And don’t forget that the trail closely parallels the new CT Rail commuter rail service in between New Haven and Springfield, which accommodates bikes. You can also bring your bike aboard the Amtrak Vermonter if you want to travel further north on the train to Northampton or beyond. Norwottuck Rail Trail – https://www.mass.gov/locations/norwottuck-rail-trail While not directly a part of the Farmington Canal system, this rail trail hooks directly into the trail Northampton. It provides a great extension of the trail between Amherst and downtown Northampton where it hooks directly into…. Manhan Rail Trail – https://manhanrailtrail.org/ This is the name of the trail once you leave Northampton and get into East Hampton. (Within Northhampton it’s just called part of the city’s bike path system). 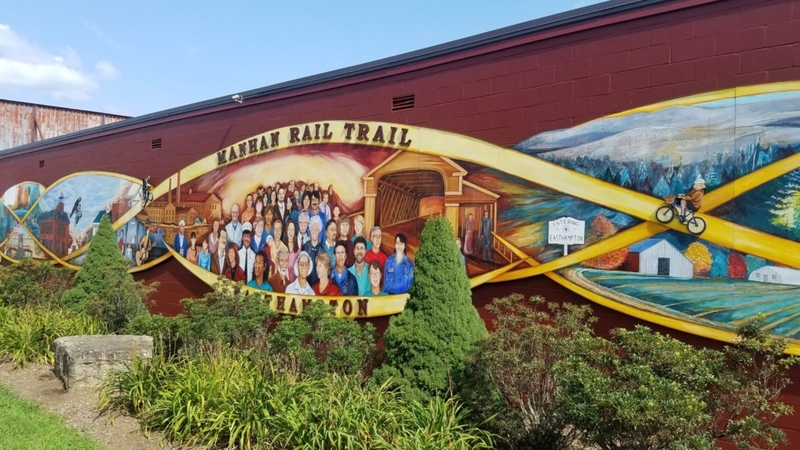 On road riding – When you get to the town of Southampton, the Manhan Rail Trail ends and you will have to take local streets. Unfortunately, the signage is not good in this one area, so you will have to plot out a route that generally follows Route 10. It’s about 10 miles to the City of Westfield, where the trail picks up again. But after that, it’s all smooth sailing on bike paths for almost the rest of the time. 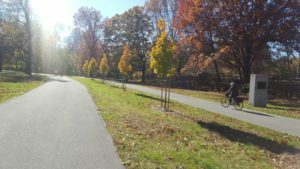 Columbia Greenway Rail Trail – https://www.columbiagreenway.org/ And just like magic, tucked behind a Stop & Shop is the Columbia Greenway Rail Trail which takes you from Westfield through beautiful agricultural areas, including tobacco fields! (Who knew they grew tobacco in Massachusetts?) This trail takes you all the way to Southwick where it becomes…. Southwick Rail Trail – http://southwickrailtrail.org/ Another name for the same great trail. This time in Southwick, Massachusetts. Southwick is the last town in Massachusetts. After this you enter Connecticut and start riding on…. The Farmington Canal Heritage Trail – http://fchtrail.org/ Thankfully, the rest of the trail is under the same name with the same maps and website. This is where the trail really begins to shine as you pass through many towns where the trail right-of-way had been interrupted by development, only to be put back together by trail designers who routed the trail through office parks and along trails adjacent to streets. You’ll pass through town after town on this well-maintained trail, with plenty of businesses to stop at. The trail runs generally uninterrupted until you reach Plainville, but at that point the trail is also marked as…. 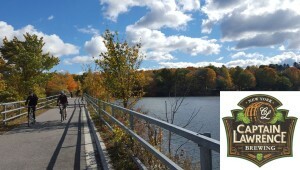 The East Coast Greenway – https://www.greenway.org/ Just north of Plainville, the Farmington Canal Heritage Trail is co-branded as the East Coast Greenway, which is a larger trail system spanning between Florida and Maine. 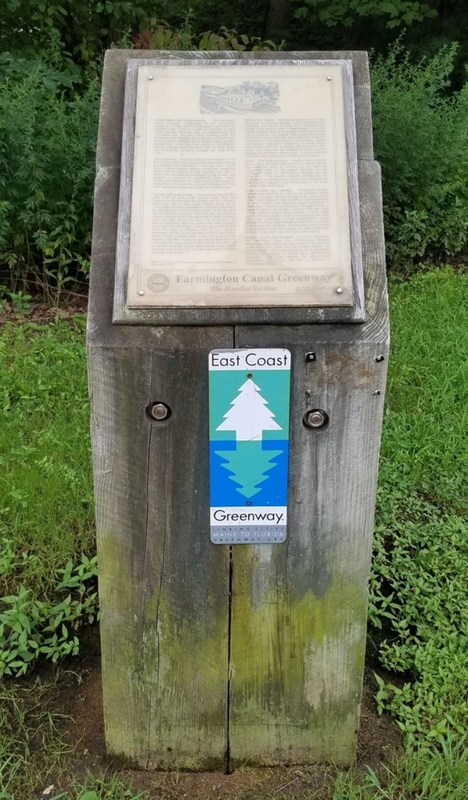 So when the trail gets interrupted in Plainville, you just follow the East Coast Greeenway markers to keep going on your route. Eventually, you’ll reach the next segment of the Farmington Canal Heritage Trail and you’ll keep riding. As you ride south, you’ll notice that the trail gets very wide, which is great since there are a lot of people on it. The trail continues on, with only one small interruption until you get to New Haven where the trail ends at the Yale Campus. Take your time to enjoy the New Haven Green, or just pedal the short distance to the train station and be on your way. 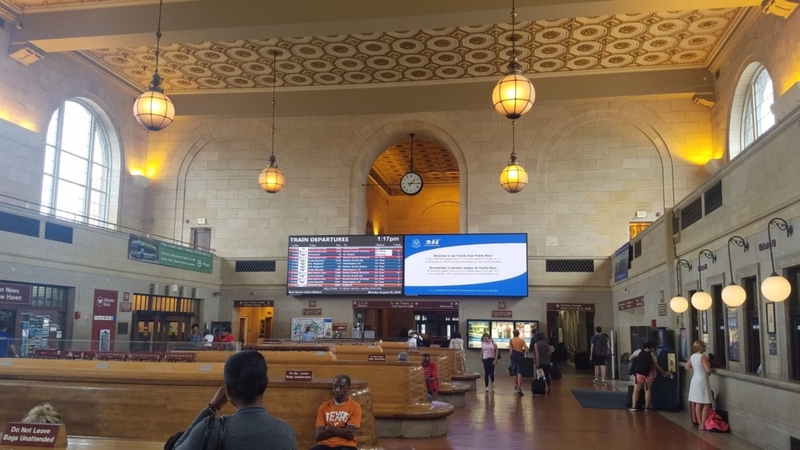 You can get trains to almost anywhere from New Haven’s beautiful Union Station. Union Station serves Metro-North, Shoreline East, CT Rail and Amtrak trains. Go anywhere! Getting between the various NYC Boroughs can be enormously frustrating if you are traveling by bicycle, thanks to bridges that were only designed for cars. While most of the bridges owned and maintained by NYC DOT have now been retrofitted with bike lanes or sidewalks, MTA-controlled bridges are another story. Unfortunately for cyclists, MTA bridges are the only link for people traveling between Queens and the Bronx, or between Brooklyn and Staten Island. Ever since the sidewalks were removed from the Bronx-Whitestone bridge in 1943, cyclists have been out of luck, forced to detour to the Triborough Bridge. The Verrazano-Narrows Bridge never even had a sidewalk in the first place, meaning that you could never ride a bike between Brooklyn and Staten Island (except for the one day a year when they do the 5-boro bike tour). You’d have to ride into Manhattan first, then take the ferry with your bike. Forcing cyclists to take such long detours is beyond ridiculous in today’s world, where cycling is more popular than ever. Thankfully, the MTA has finally understood this and has implemented a bike rack program for local buses that go across both the Bronx-Whitestone Bridge and Verrazano-Narrows Bridge, to help cyclists use bridges that should have been open to them in the first place. And if you are unsure of how to use a bus bike rack, there is a dull instructional video you can link to from the MTA’s press release. Or, for a more entertaining tutorial, click here! 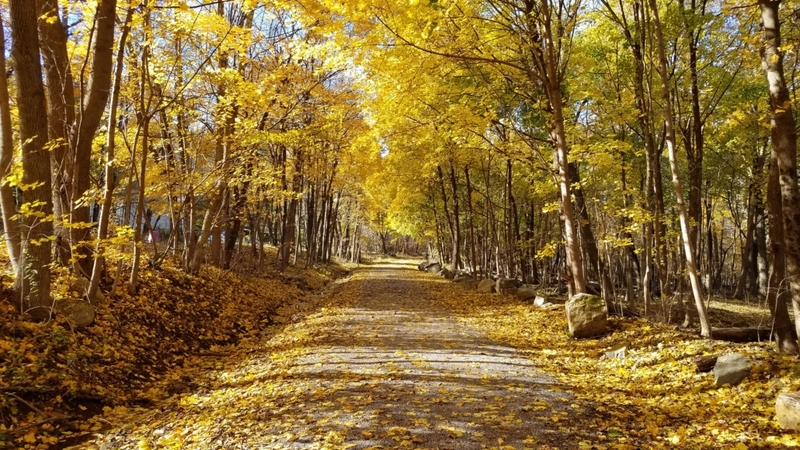 The Harlem Valley Rail Trail is one of the most beautiful rail trails in New York State. It’s also one of the easiest to get to since begins in a Metro-North train station parking lot. 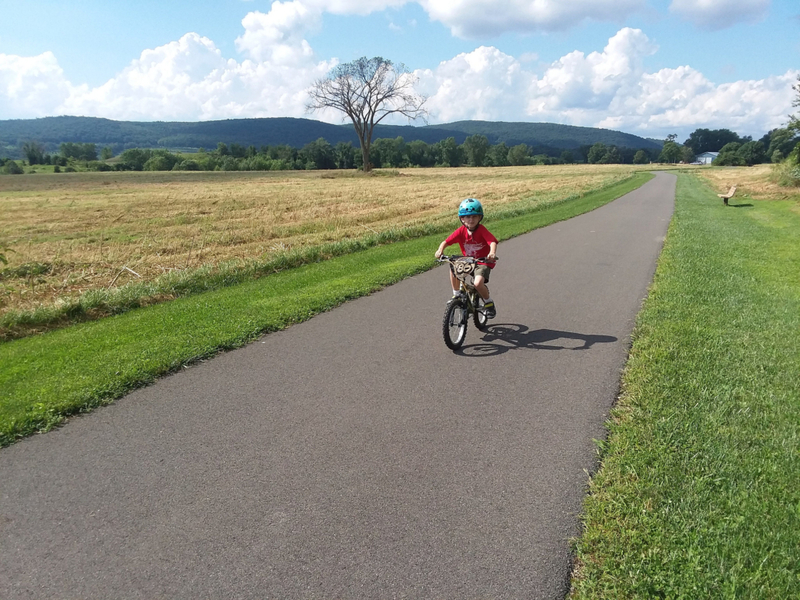 The Harlem Valley Rail Trail also has lots of amenities along it’s route including farmers markets, restaurants and swimming holes. It’s the perfect getaway for a day ride. And it also makes for a great destination for two of the tours we offer at Gotham Bicycle Tours: our Hudson Valley Bike Tour and our Harlem Valley Rail Ride Weekend. We also run private tours on this trail, because it is so nice! 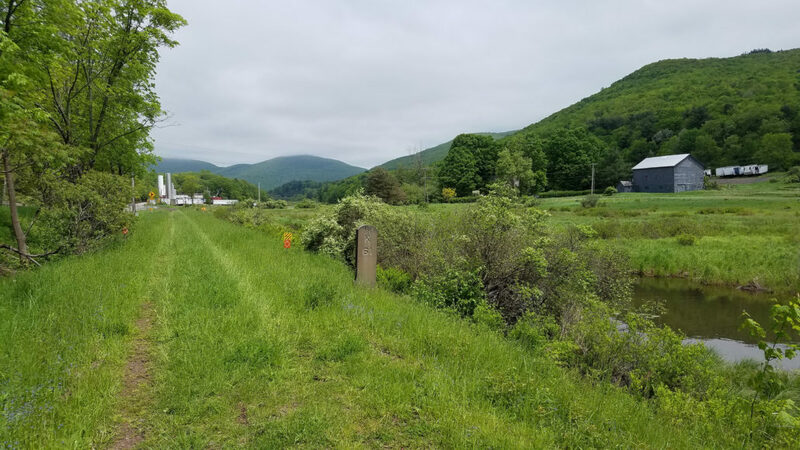 The Harlem Valley Rail Trail can trace its history back to 1852, when the New York and Harlem Railroad was constructed as far north as Chatham, New York. The New York and Harlem was one of America’s oldest railroads, which was eventually absorbed into the New York Central, and ultimately into Metro-North Railroad as the Harlem Line. However, by the time Metro-North Railroad acquired the line, commuter rail service only went as far north as Dover Plains, with the rest of the line being abandoned. Fortunately in the late 1990’s, Metro-North undertook an extension of the Harlem Line to Wassaic, NY. As part of the extension, the Harlem Valley Rail Trail was built on top of the abandoned rail alignment north of Wassaic. With this project, the first “intermodal” train to bike hub was created in the New York Metro region. The amenities on this trail are some of the best around. There are always plenty of places to eat in Millerton, 11 miles north of the trail start in Wassaic. 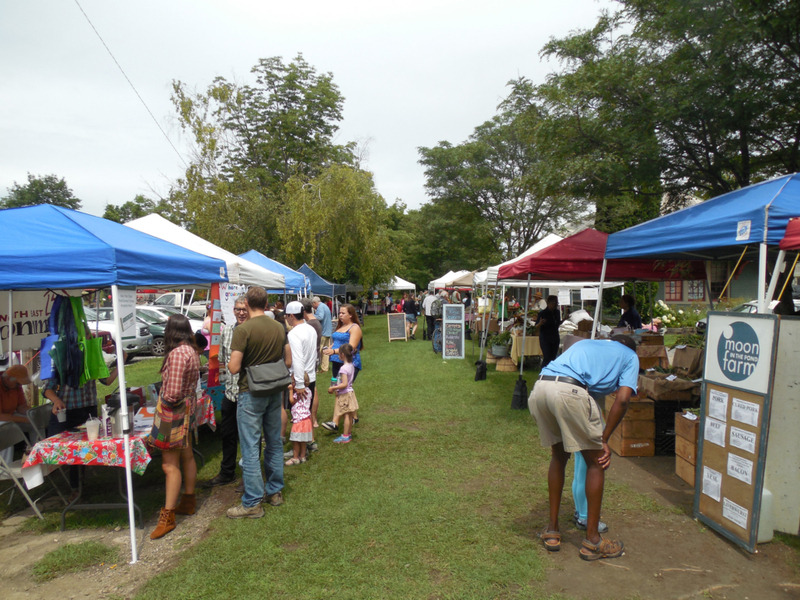 On Saturdays you can even grab lunch at a great farmers market that has all kinds of wonderful food from all of the farms you just rode past on your bike. 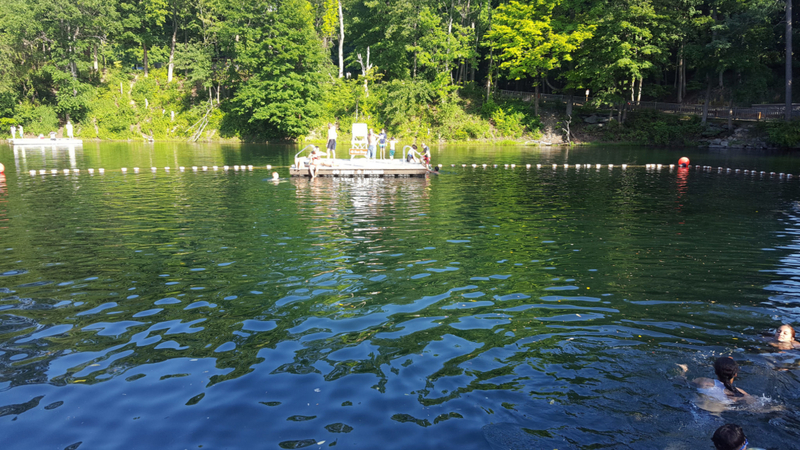 As you push north, you’ll pass Taconic State Park in Copake Falls which has camping, a waterfall hike…and a great lifeguarded swimming hole in an old quarry that is super refreshing on a hot summer day. Just north of the park is one of the most scenic segments of the trail, where you ride through a lush valley. The first time we rode through this spot with our 6-year old son, he asked us “is this God’s world?” because it looked like the pictures he had seen of Heaven! 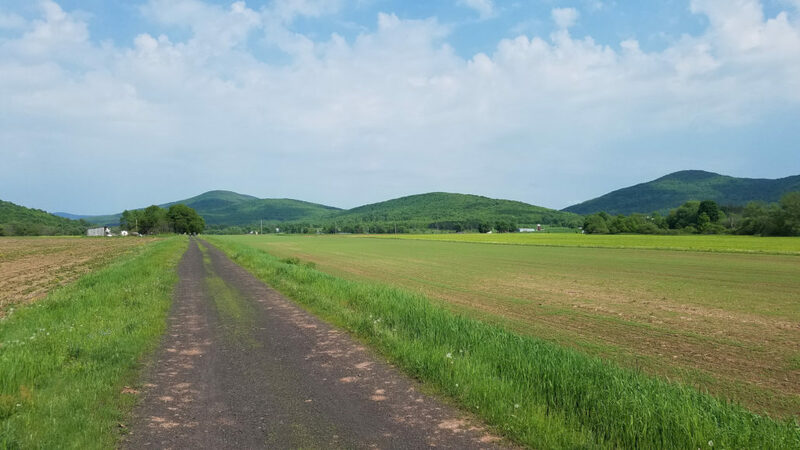 Have you ever been driving (or biking) along somewhere in New York State and wondered about the little green signs that you keep seeing over and over on the side of the road? These little signs are actually reference markers put up by the NYS Department of Transportation after the Highway Safety Act of 1966 required that “each state shall have a highway safety program…. (that) shall include, but not be limited to, provisions for….surveillance of traffic for detection and correction of high or potentially high accident locations”. In short, in a pre-computer and pre-GPS world, each state needed to figure out their own way to reference every segment of state-owned roadway for traffic, maintenance and crash reporting purposes. 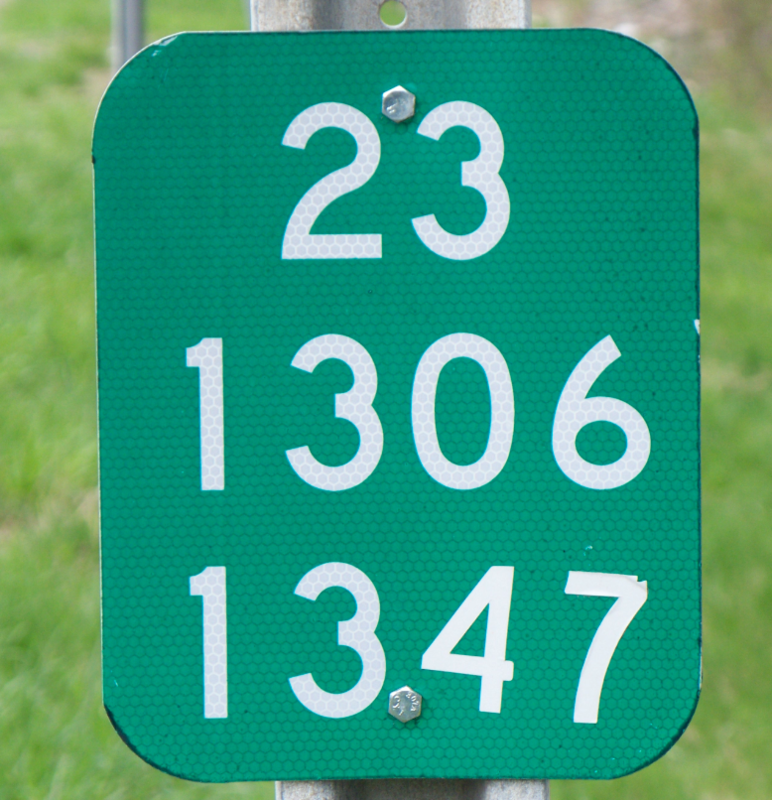 And, of course, New York State being what it is, came up with an ingeniously confusing, complicated, yet workable solution, which culminated in these little green signs that show an almost nonsensical jumble of numbers and letters. But these signs are a great resource if you are ever lost on your bike and you need to figure out what road you are on. The top row of these signs is (almost) always the route number for the state road on which you are traveling. So in the absence of other signage, these little green markers can at least help you figure out what road you are on. On most 2 lane roads, they are every 0.2 mile, so you don’t have to bike far to figure it out. If you are riding on a 4-lane road, you’ll see them every 0.1 mile. If you are interested in the real nitty-gritty about how these little green signs work, check out the NYSDOT Reference Marker Manual. It’s fascinating. It will make you appreciate the lengths that people had to go to to code highway segments before computers and GPS could just assign everything a coordinate. And keep in mind, you will only see these signs in New York State. Other states have their own signs, which may or may not make sense. Getting to the trail. 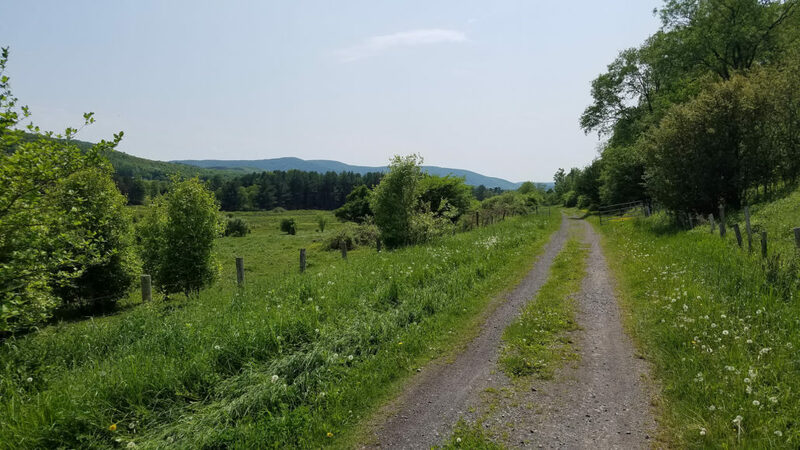 The Catskill Scenic Trail is located in the northwestern portion of the Catskills, mostly in Delaware County, but also with a portion in Schoharie County. It’s about a 3 or 4 hour drive to get to the trail from New York City, depending on the route you take and the traffic. The trail is not served by public transportation, so you must drive to the trail or find a ride. But once you are there, you’ll quickly find out that it was worth the effort to get there. A good place to start for planning your ride is to think about where you will park. The Catskill Scenic Trail website has a great map of the trail that shows the communities that the trail passes through, as well as where to park. Most of the time, the parking is provided in dirt lots near where the trail crosses roads. Sometimes these ares are more or less side-of-the-road pullover areas. Wherever you park, keep in mind that you will most likely need to ride out on the trail, and then turn around to come back, to get back to your car. The only way to just ride this tour one-way is to do a car shuttle with 2 cars, or to hire a bike tour company like Gotham Bicycle Tours to set the ride up for you. Some of the communities you will pass have more services than others. In general, the communities with the most services are at the southeast end of the trail: Roxbury and Grand Gorge. 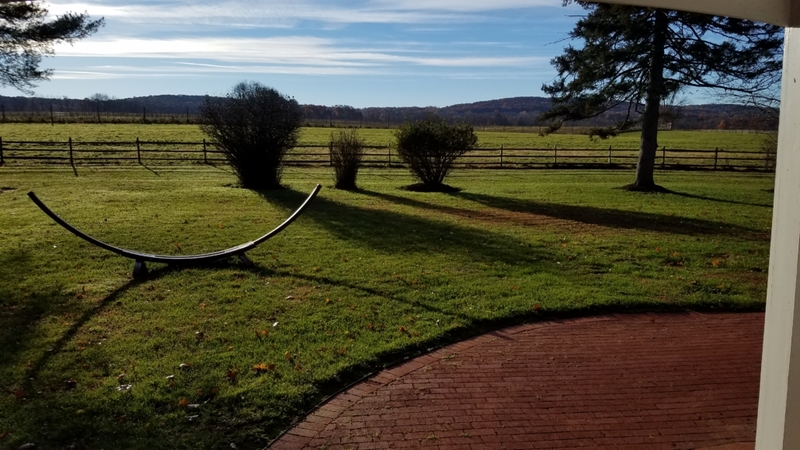 These two communities have lodging options as well as a small number of restaurants owing to their proximity to Plattekill Mountain ski resort. As you move west, the communities get smaller. Stamford (the halfway point on the trail) has a few places to eat. Moving west, Hobart, South Kortright and Bloomville have fewer restaurants and services, although they still each have some. Please note that because these communities are very small, some businesses may not be open every day. So call ahead before you start riding. You don’t want to arrive at a restaurant hungry, only to find that it is closed that day! The riding experience. This trail used to be part of the Delaware and Ulster Railroad, which once chugged into the Catskill Mountains between Kingston and Oneonta. The last train ran in 1976. Since that time the 26 miles between Roxbury and Bloomville has been transformed into a bike path. And the section between Roxbury and Arkville now operates as a scenic railroad. Most of the trail still has the old mile markers from the railroad’s days of operation, with distances shown to Kingston. The bike path generally runs between Mile-Marker 60 and Mile-Marker 86. The experience this trail offers is rugged and remote. There are some sections where you are basically riding through tall grass, so you will want to bring bug spray to spray your legs to protect against ticks and mosquitoes. Fortunately, the more rugged sections of trail are the sections closest to the services in case anything goes awry or you want to take a break. The trail between Roxbury and Grand Gorge is tough: mostly riding through grass and dirt that gets very muddy after a rain. Depending on the exact conditions, riding here can be difficult, depending on the type of bike you are using. As you make your way west, the trail becomes less bumpy and transitions away from grass to stone-dust and gravel. You can expect more consistent trail surfaces west of Stamford, which is probably the easiest portion of the trail to ride. But no matter which trail segment you pick to ride, you should definitely consider using either a hybrid or mountain bike for the trail conditions you are likely to encounter. Just about all portions of this ride are equally scenic. You can take a look at a complete photo album at this link. The pictures are taken from southeast to northwest: from Roxbury to Bloomville. Now that bike touring season beginning, it’s time to start thinking about where you will ride. One idea to get your thinking going is to consider starting or ending your tour in Trenton, New Jersey. There are lots of options for day rides and overnight tours that start or end in Trenton. And Trenton far surpasses all of the other small Northeastern cities when it comes to bike-friendly transit access. The post below is a “re-print” of a 2017 post by Lukas Herbert on the Adventure Cycling Association blog page. You can find the original posting here. March 9, 2017 – Lukas Herbert kindly submitted today’s guest blog. 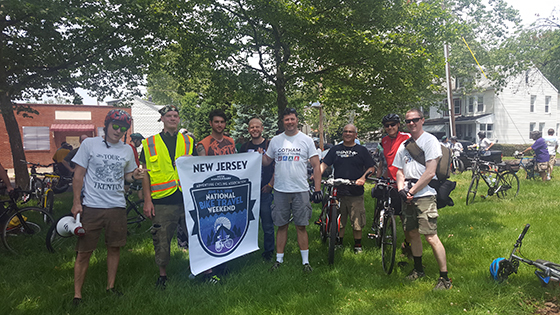 Gotham Bicycle Tours celebrated Adventure Cycling’s 2016 Bike Travel Weekend in Trenton and looks forward to this year’s event on June 2–4, 2017. But Trenton has something that no other Mid-Atlantic city has: an abundance of bike paths and excellent, bike-friendly train service from two major metropolitan areas, Philadelphia and New York City. 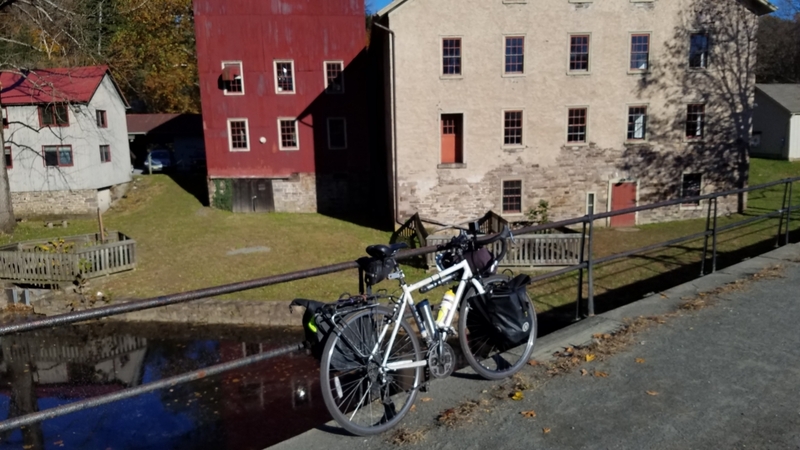 This easily makes Trenton my top launch point for bike tours that can take you to great places in New Jersey and eastern Pennsylvania, and potentially as far away as Delaware or New York State. The first great thing about Trenton for bike touring is how easy it is to get there with your bike. Trenton is the only city in the Northeast where two major transit systems meet: the New Jersey Transit’s Northeast Corridor line and the Trenton Line Regional Rail. 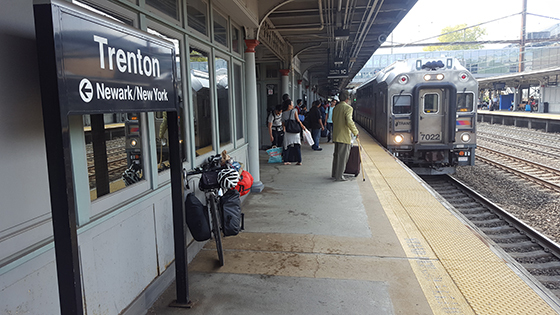 This means that no less than once every hour, a train arrives and departs Trenton for both New York City and Philadelphia, connecting Trenton to two vast systems of trains. Bikes are permitted on both systems. 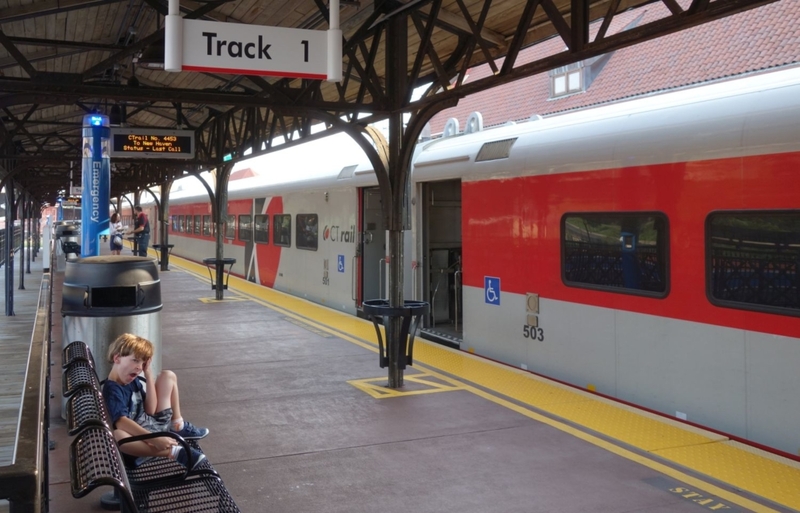 In addition, the River Line light rail also connects Trenton with towns in South Jersey along the Delaware River, expanding your choices even more. 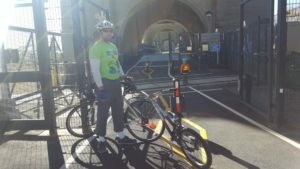 This means that you can easily do a day ride, overnight, or multi-day bike tour that starts or ends in Trenton and uses the train to get you home, or back to your start point. The Trenton Transit Center is a hub for New Jersey Transit and SEPTA trains, both of which allow bikes on board for free. The transit connections alone are enough to make Trenton a sensible place to start a ride. 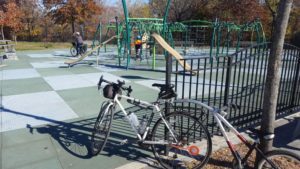 But when you throw in the substantial number of bike paths that go through or near Trenton, you can really come up with a wide range of rides, suitable for all levels of riders. For example, the Delaware and Raritan Canal State Park Trail centers on Trenton. You can ride the Main Canal for 34 miles northeast between Trenton and New Brunswick. Or you can ride 30 miles north along the Feeder Canal to Frenchtown. If you cross the Delaware River, the Delaware Canal Towpath goes along the Pennsylvania side of the river, part of the Delaware and Lehigh National Heritage Corridor, a trail that can take you as far as Wilkes-Barre, PA. And someday soon, the East Coast Greenway will slice right through Trenton on its way from Maine to Florida! An off-road trail network goes right through Trenton. If road riding is your thing, it’s not very difficult to get from Trenton to low-traffic roads that will have you riding towards the Pine Barrens where you can cruise along on relatively flat, scenic roads … most of which have bike lanes. You can even ride to a growing number of wineries that are becoming a fixture of New Jersey’s landscape. (You didn’t know New Jersey was a wine growing state? You do now!) You can ride all the way out to the Jersey shore, and if you make it to Cape May, you can even take a ferry to Delaware for more great riding. 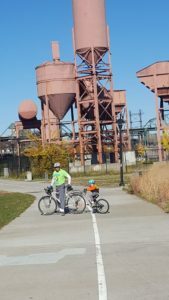 Ride north along the Feeder Canal trail on the New Jersey side of the Delaware River, then cross over to the Pennsylvania side and ride back. Camp or stay in a hotel halfway to make a weekend of it! Or head south for a couple of days of riding and hook up with the NJ Transit Atlantic City Line or the River Line to get back. All NJ Transit buses in South Jersey are also equipped with bike racks, so the ride combinations are almost limitless. Just use your imagination … then research your route. 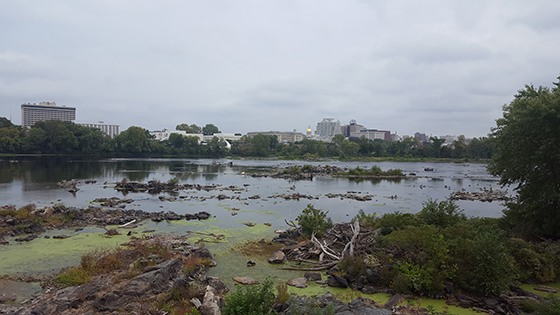 Trenton is situated along the Delaware River which has bike paths on both sides. But Trenton isn’t just a great gateway city for bike touring, it’s also a fun place to ride. If you like riding past historical sites on low-traffic roads, you can’t beat riding around Trenton on a Saturday or Sunday morning. The roads are completely quiet (thanks to State government being closed) and the City has done a great job of striping bike lanes in some parts of the city. Trenton even has a great bike tour every year: the Tour de Trenton. We used this great tour as the starting point for our Bike Travel weekend ride in 2016. 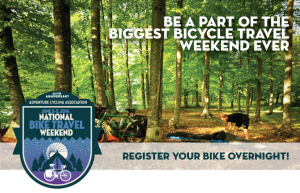 (Register your own Bike Travel Weekend ride for June 1—3, 2018.) After the Tour de Trenton, we rode to Cream Ridge Winery where we camped for the night as part of one of the tours we do with our bike touring company: Gotham Bicycle Tours. So if you’re looking for great cycling destination in the Northeast, Trenton should be on your short list. It’s the center of bicycle touring for cyclists who are “in the know.” And now that you’ve read this to the end, consider yourself part of our elite group! A great esplanade was built above a waterfront highway. Paving stones and archways present a timeline of the city’s history that you can read while you ride! Get away to Randalls Island! An easy bike ride you can do in NYC. 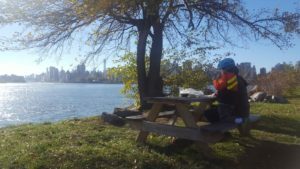 If you are looking to get away from the hustle and crowds of NYC…but not leave the city, riding your bike to Randalls Island is a great way to spend an afternoon. It’s an easy, pleasant ride from Manhattan, Queens or the Bronx. And it’s also a good spot to take children to since there are plenty of car-free bike paths, and plenty of things to check out! If you are coming from Manhattan, the best way to get there is to ride to East 102nd Street. Go down 102nd Street until it ends at the East River. Ride onto the sidewalk on the north side of the street, then make a left along the FDR drive an you will soon see a ramp going up to a pedestrian bridge. Take that to the island. From Queens, you will need to ride to Hoyt Avenue North and 27th Street where the RFK Triborough Bridge sidewalk begins. Unfortunately, you’ll have to deal with a lot of stairs crossing over to Randalls Island, so be prepared! 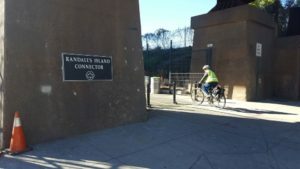 But the nicest way – by far – to get to Randalls Island is from the Bronx, where the new Randalls Island Connector gets you to the island. Access the connector from 132nd Street between Walnut Avenue and Willow Avenue. That’s the way we did it. 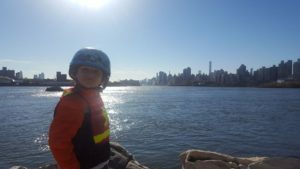 We made a great day ride using the Bronx River Greenway to go from the northern end of NYC to Randalls Island. The pictures below tell the story! We started the ride by going down the Bronx River Pathway with its beautiful autumn colors! There were plenty of playgrounds along the way for our son to stop and play. Here’s the entrance to the Randalls Island Connector. The connector bike path goes below the Amtrak tracks…and then crosses the Oak Point Rail line. A nice view of the Hell Gate Bridge. Rail fans will love it! 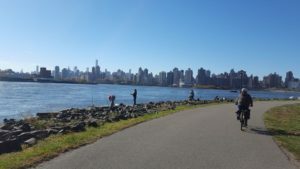 Bike paths within Randalls Island give an excellent view of the Manhattan skyline! A great spot for lunch! End the day with miniature golf! Randalls Island has something for everyone! Check it out! 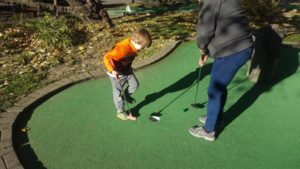 Not only can you do miniature golf, but there are batting cages, nature walks…and concession stands where you can buy lunch. You can really make a nice day of it on Randalls Island. https://gothambiketours.com/wp-content/uploads/gotham-bicycle-tours-logo2.png 0 0 Laura Willis https://gothambiketours.com/wp-content/uploads/gotham-bicycle-tours-logo2.png Laura Willis2016-11-18 15:11:552016-11-18 15:13:41Get away to Randalls Island! An easy bike ride you can do in NYC. National Bike Tour Weekend 2016! National Bike Travel Weekend is June 3-5. It’s a wonderful initiative being undertaken by our friends at the Adventure Cycling Association to get as many cyclists as possible out for a bike tour during the first weekend in June! And we want you to be a part of it! That’s why we are proud to be offering our Beaches to Farms: A Winery Experience Bike Tour for National Bike Travel Weekend. It’s a fabulous ride that’s not too far away….and you get a bottle of wine with your name on it at the end. 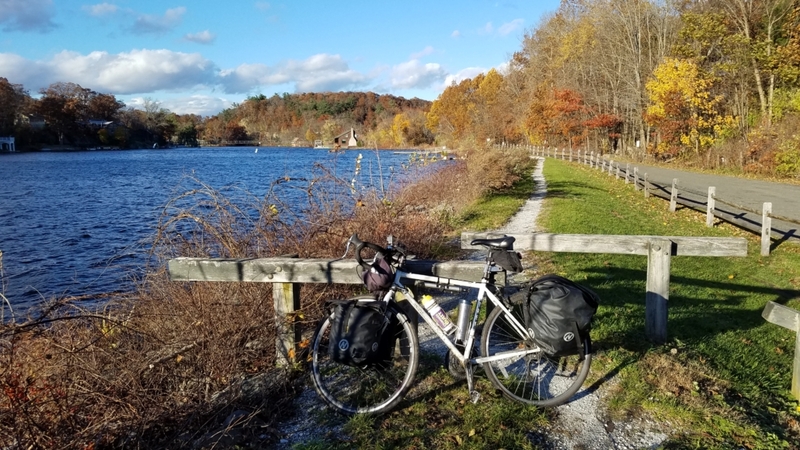 This ride was actually featured on Adventure Cycling’s “Bike Overnights” website, which is a great resource to use for anyone looking for inspiration to plan their own overnight trip. Check out all the details about the tour here. How long is this ride, and is it hilly? This ride isn’t particularly hilly, since a lot of it is on rail-trails or canal paths. Each day you can choose the mileage you want to ride, ranging between 25 and 58 miles. What happens if it rains? We run the trip rain or shine. So we’ll be riding in the rain along side you! But, you can always back out of the ride if the weather forecast looks bad. You only need to make a $100 non-refundable deposit to hold your spot, and then you can pay the balance as late as Wednesday, June 1. So if you don’t like the weather forecast, you can bail out and you don’t have to pay the balance. Are there showers and flush toilets where we camp? 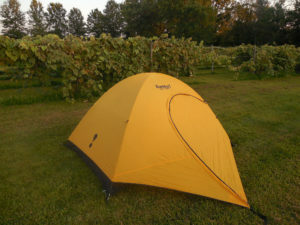 For this particular tour, we camp out in the vineyard behind the winery tasting room. So we have access to the tasting room bathrooms throughout our stay. For the shower, we rig up an outdoor shower using a forklift and a water tank where the water is heated. I don’t want to camp. Are there other options? Yes. We can shuttle you to a nearby hotel for the night if you do not want to camp. It’s only 10 minutes away in the support van. Then just start your ride from there the next morning. Will I be able to charge my IPhone? Yes, yes…you will totally be able to do this. You’ll need to keep your smartphone charged anyhow to take advantage of our GPS navigation for this ride! Who comes on these rides? All kinds of people take our rides. We generally get a wide variety of ages and abilities, and we make everyone feel comfortable. Most tours are limited to 9 riders for a small group feel. https://gothambiketours.com/wp-content/uploads/gotham-bicycle-tours-logo2.png 0 0 Laura Willis https://gothambiketours.com/wp-content/uploads/gotham-bicycle-tours-logo2.png Laura Willis2016-05-11 16:36:262016-05-11 16:36:26National Bike Tour Weekend 2016! https://gothambiketours.com/wp-content/uploads/gotham-bicycle-tours-logo2.png 0 0 Laura Willis https://gothambiketours.com/wp-content/uploads/gotham-bicycle-tours-logo2.png Laura Willis2016-05-09 11:45:432016-05-09 11:45:43AAA Bicycle Service! Riding a bike to Montauk! Have you ever wanted to do that one “big ride” to challenge yourself? Riding my bike to Montauk from my apartment in Brooklyn was the first time I had ever dared to ride more than 100 miles in one day. It was 1998. I was only 23 years old. I had just finished college. I had started a new job…and I decided to train all summer to meet this goal. I wanted to do this ride one-way…and take the LIRR back home when I was done. Back then, you couldn’t bring your bike on the LIRR Montauk branch before Labor Day. So I waited until the week after. I remember going to the Hagstrom Map Store on 43rd Street and 6th Avenue to buy all the maps I would need to plan my journey. The ride would be about 115 miles long…if I didn’t get lost. I spent a ton of time trying to figure out what roads to ride, how to do this, etc. But I couldn’t wait! I had only been to Montauk as a kid with my parents. Now I was ready to go there on my own…on a bike! The ride exceeded my expectations. And when I saw that lighthouse at the end of the ride it blew me away. I went down to the rocky beach below the lighthouse and I saw about a dozen fisherman casting their lines out into the surf. One guy was holding a huge fish he had just caught. I wondered if his feeling of accomplishment was similar to mine. I had caught a huge prize of my own…riding to Montauk! Since that first ride, I have ridden to Montauk many times. Each time I learned a little more. I discovered how to use the trains effectively to do different kinds of rides. I learned where to camp. Where to get a good dinner. And were the best scenery was. 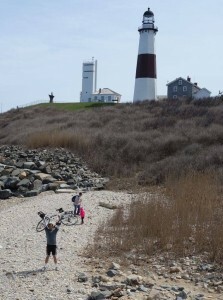 Three years ago I decided to put all of this knowledge into the first bike tour we ever offered at Gotham Bicycle Tours: Our Montauk and Eastern Long Island bike tour. It’s all the highlights of my many bike trips to Montauk condensed into a weekend that you can experience. Since not everyone wants to ride a hundred-plus miles, we have several different routes to choose from between 16 and 60 miles…each one designed to give you a feeling of accomplishment when you reach THE END! And forget about pouring over paper maps! We have all the routes figured out for you, and you can get turn-by-turn navigation from a GPS app on your smartphone. Doing a bike overnight to Montauk and the Hamptons has gotten easier than ever! https://gothambiketours.com/wp-content/uploads/gotham-bicycle-tours-logo2.png 0 0 Laura Willis https://gothambiketours.com/wp-content/uploads/gotham-bicycle-tours-logo2.png Laura Willis2016-04-19 16:02:542016-04-19 16:02:54Riding a bike to Montauk! A favorite pastime for many cyclists is to do a big ride that ends at a craft brewery destination. There’s nothing better than enjoying a beer at the end of a big ride! But getting back on that bike after drinking that beer can be tough going…or even dangerous if you’ve had a few too many. Unless the brewery you’ve ridden to is next to a train station, or you’ve made plans to have someone pick you up, riding those final miles after your brewery ride can be a challenge. That’s why we came up with our Captain Lawrence Bicycle Tour. Captain Lawrence is a locally famous brewery…you can find their beers in many stores and restaurants throughout the tri-state region. 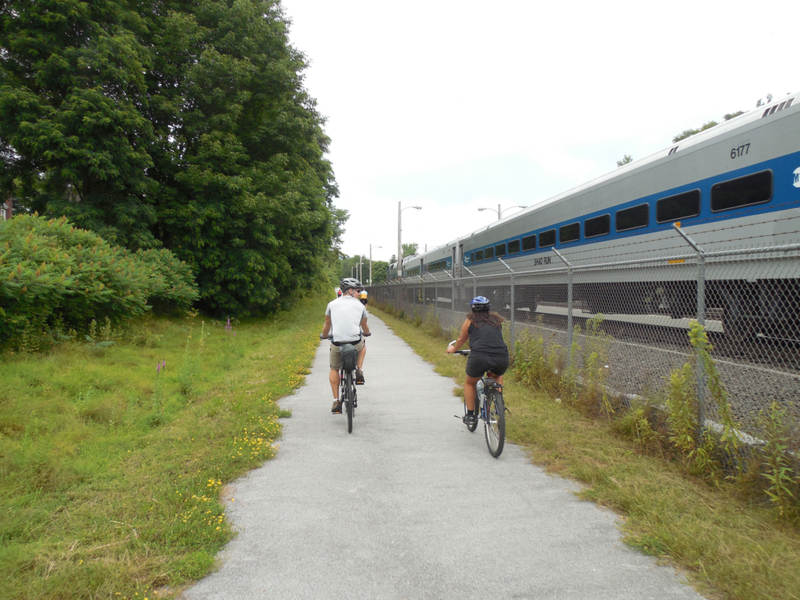 And to ride to Captain Lawrence is relatively easy….its about a half-mile away from a great rail-trail. But because rail-trails are in the locations where trains used to be….unfortunately there’s no easy way to get home with your bike if you don’t want to do any more riding. And that’s the situation we were hoping to remedy with our bike tour. Captain Lawrence is a great brewery to experience, and given its proximity to New York City, it should be easy ride for anyone from the city to do…and now it is! Check out our ride details on our website! With lunch, rail-fare and a ride back to the train included…it’s an unbeatable value for an all-inclusive day trip from the city! https://gothambiketours.com/wp-content/uploads/gotham-bicycle-tours-logo2.png 0 0 Laura Willis https://gothambiketours.com/wp-content/uploads/gotham-bicycle-tours-logo2.png Laura Willis2016-04-04 15:46:572016-04-04 15:46:57Craft beer and biking! We are glad to be back for the second year of OutdoorFest! OutdoorFest is a 10-day outdoor adventure festival that aims to connect New Yorkers to live healthier and more adventurous lives. Look for us at the Outdoor Adventure Expo on Sunday June 19th from 12-5pm or ride with us the week before on Sunday, June 12th! Getting in shape for the season! https://gothambiketours.com/wp-content/uploads/gotham-bicycle-tours-logo2.png 0 0 Laura Willis https://gothambiketours.com/wp-content/uploads/gotham-bicycle-tours-logo2.png Laura Willis2016-04-03 14:11:502016-04-03 15:56:29Getting in shape for the season! 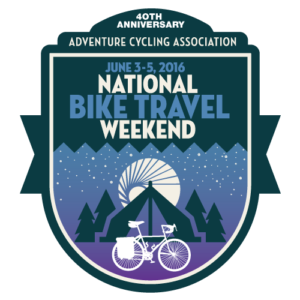 Gotham Bike Tours is pleased to participate in National Bike Travel Weekend, June 3-5, 2016.